Author Holly Black calls her Curse Workers series “mobster fantasy,” an unusual description for a most engaging trilogy. Seventeen-year-old Cassel Sharpe is in a world of trouble, and considering the world he lives in that’s saying a lot. For starters, Cassel is being squeezed between a secret branch of the FBI and a Russian mobster; both want him because of his extraordinary power as a transformation worker. In Cassel’s society, a few members of the population are curse workers, people possessing the ability to manipulate the luck, dreams, emotions, or memory of others. But in the entire world, only a handful of people, including Cassel, are transformation workers with the power to change anyone into anything—animal, vegetable, or toaster oven. Author Holly Black calls her Curse Workers series “mobster fantasy,” an unusual description for a most engaging trilogy. Set in an alternative contemporary reality, mobsters’ currency of choice is curse workers, rather than drugs and guns. After all, he who controls the dreams, memories, and emotions of others can pretty much control the world using only the bare hands of oppressed curse workers. Because it’s impossible to tell who is a curse worker and who isn’t, everyone must wear gloves at all times. In Cassel’s world, ungloved hands are as dangerous as a loaded gun. Cassel grew up in a family of curse worker grifters always on the lookout for the next con. Cassel only recently discovered that he’s a transformation worker because his brother, a memory worker, messed with the memories of what he’d done. Cassel was tricked into mob assassinations but has no memory of it. He even turned his girlfriend Lila into a cat. When the memory work fades away, Cassel realizes just who he is and what he can do. He releases Lila—whom he’s loved since young childhood—from the cat spell. Then his mother, an emotion worker, lays a loving spell on Lila. She’s forced to love Cassel against her will. Needless to say, she’s one angry girl. All Cassel wants now is to put the past behind him and to live a good life. He wants to graduate from high school. He wants for Lila to love him sans spell. But a few little things keep him from meeting his goals. Russian mob boss Zacarov (who also happens to be Lila’s father) is holding Cassel’s mother prisoner, and Cassel must track down a priceless diamond that she stole from him. The Feds want Cassel to transform the governor of New Jersey because they don’t like his anti-curse worker politics. 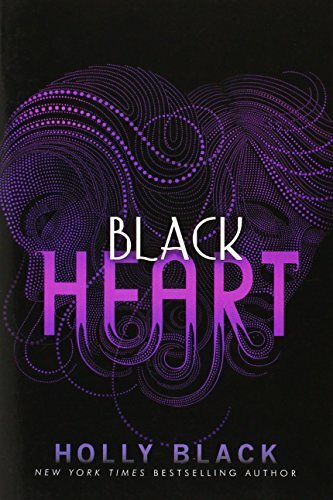 Ms. Black has created a deliciously dark and edgy world quite unlike anything else in today’s teen literature. Cassel is an appealing character whose desire to do the right thing in spite of his family’s criminal proclivities and his own past makes the reader want to root for his success. Lila is complex and conflicted. While this book works well as a stand-alone, for maximum enjoyment, read all three in The Curse Worker series—White Cat, Red Glove, and Black Heart—for a reading experience you’ll long remember.